This thread is meant as a resource for all of us who buy online. Please post the vendor image(s) of your stone and personal pictures you took so we can all learn how stones bought online look in real life. Please include the vendor's name and any information you have on the stone if possible. Set of three green tourmalines from ebay seller gemdd, estimated at 1ctw points. Color is very similar to vendor image. Darker stone is brilliant, but windowed. Would consider buying from again. First image is vendor image. MissyBeaucoup and Matthews1127 like this. Barry Bridgestock green tourmaline 1.18 ct. 6.5 mm. VERY similar in color - a little darker in real life but barely noticeable. Barry Bridgestock Bekily Malaya garnet. 1.34 ct. 6.5 mm. LOVE this stone. Barry told me it had this strange color shift from pink to peachy in sunlight. It really does - indoors it''s quite pink, next to the window it''s peachy-pink and in direct sunlight it goes golden. Hard to capture the effect though but it is sparkly! Jazzybling and Matthews1127 like this. Barry took the picture all the way to the left, and it was a bad picture, and really looks nothing like the stone. He even said so. The only good thing about that picture was that the stone wasn''t scooped up right away. He then took a much more accurate color corrected picture in the middle, and that sold me on the stone. The picture to the right is my blurry, but accurate picture. InsecureSweetGirl, GirlwithGems and Matthews1127 like this. Barry Bridgestock blue spinel. 2.41 ct. 8.1 mm. It's a color changer. The pictures really don't do this stone justice. It's a bright sparkly blue in sunlight and under fluorescent light it's a rich bright purple. Lighter and brighter than in the pics. Shifts to pink/lavender in incandescent light. Darker than vendor picture but with lots of brilliance. Top image is vendor image. Barry Bridgestock colorless (achroite) tourmaline. 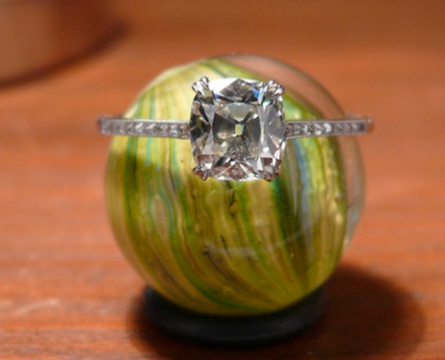 2.5 ct. 8.5 mm. This stone is a bit warmer than in the pic although in direct sunlight, it looks very colorless, and pretty much exactly like the color in the picture. It picks up color from its surroundings pretty easily though. Unfortunately, I do not have any stones to add but I wanted to thank you for starting this thread. This makes it much easier to shop online! Dan Stair grossular garnet. 0.65 ct. 5.55 mm. This one is more yellow than the vendor picture (to the right) shows. It comes close to the vendor pic in direct sunlight but there is a definite warmth/yellow tone to it. More pronounced indoors. The horrible ebay vendor pic on the left (vallejo916) and my pic on the right. Dan Stair sapphire 0.82 ct. 5.52 mm. This sapphire is much darker in real life than in the vendor pic. It can give up really pretty blue flashes but the light needs to be pretty strong. In ordinary lighting and especially indoors it is VERY dark. That''s just gorgeous TL, another glowing stone. I''m having a very blue/green day today, fall-out from all those paraibas at the weekend! Dan Stair umbalite garnet. 1.98 ct. 7 mm. This stone is actually darker and redder than in the pic - I rarely see pink in it. It is very sparkly and gives off great flashes of light, indoors and out. Vendor pics are on the left. There is a significant color shift, and I can't capture the purple as well as Barry did. Wow...those Dan Stair pics are definitely much lighter in the vendor pics than in person. Beautiful (of course) but did you feel mislead when you opened the package? Jeff White blue/green Afghan tourmaline. Middle pic in incandescents and right side in sunlight. This is a very dichroic stone. 2.6ct indicolite tourmaline from gemline inc. Vendor pic on the left. Awful, super photoshopped 6 carat violet cuprian from ebay. I took a chance since it had a GIT memo and I got it for a few hundred. Not bad for a rare color. It does have a lot of blue in it. The vendor photo is definitely more purple. One of my best ebay experiences. This stone was rather disappointing as well because of the color discrepancy between vendor photo and real life. Yes but only for the sapphire. That one was just really different from the vendor pic. I''m really happy with my garnets though, plus with my grossular I knew it would be a bit darker than the pic so I wasn''t surprised. The customgems (stair) pics really seem a LOT lighter than the real thing. Not sure I could buy from them for that reason...doesn't seem representative at ALL. ETA, BB's pics seem pretty good. Great idea for a thread! Wish I could post the only example that I have, but since I don't own the stone, I can't!